Have your voice heard, share your experience. The Sydney North Health Network’s vision is: Achieving together – better health, better care. To achieve our vision, we are committed to asking our local community what is working well in health services and what needs improving. 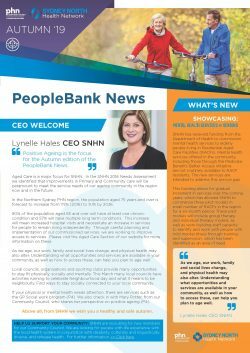 Our PeopleBank program enables you to become part of a network helping to work towards better health in the Sydney North area. Contribute to a stronger, more responsive health system. Be part of creating healthy people and a healthy community.